I have this little issue. It has plagued me since I was a tween. I am an obsessive compulsive doodler. If I have a pen and paper, I am done. My entire life, notebooks have been covered in scribbles ranging from hearts to bubble letters to that 9 dot game where you have to connect the dots without crossing lines… even in college. I rarely payed attention in class because I was too busy perfecting my corner cluster of stars. My mom once said that giving me a pen was like giving a murderer a loaded gun because I destroy everything within reach. Morbid? Yes. And totally true. Sidebar: Do you know my friend Amanda? She is awesome. She makes delicious food and takes amazing photos and also offers a bunch of fun FREE handwriting fonts on her blog. I know. I think she is my soul mate too. Anywho… I draw freaky hearts all over my possessions. Now you know. Amanda had an incredible idea to help the tornado victims in Alabama. She had a few of her blog friends submit their handwriting, then she worked her magic and made them into fonts! Totally cool. Totally wizard-like. Totally something I couldn’t do. You can now download my handwriting… cool, right? You can write your term paper or a love note or your grocery list or your work resignation or your super private diary entry with my handwriting, which would be like me writing it but it’s really you writing it but it just looks like me writing it. Wait… what? I even drew you this cupcake for when you get hungry. It is calorie free, just like all the cupcakes I bake. Me = artist. If you love the fonts, consider making a donation to Toomer’s For Tuscaloosa, a group who has organized an all volunteer state-wide effort to provide food, shelter, clothing to thousands of people around Alabama affected by the April 27th tornadoes. And thanks to Amanda! 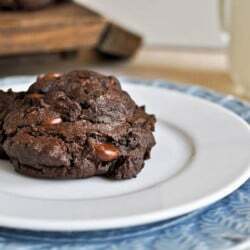 Triple Threat Chocolate Fudge Peanut Butter Cookies. That IS so so cool!!! I’m totally going to check it out. Thanks Jess! Oh i adore Amanda’s site and fonts! And i have to say, your font is so cute! Totally snagged it. So cool!!! I went and downloaded the fonts!!! what an awesome idea!!!!!! I’ll definitely be downloading new fonts!!!! That is really fun. At work we handwrite our names for our name tag and mine is my first name with a little smiley cupcake and a cherry on top. So cool!!! I love her fonts!! uh ohhh another procrastinaing thing for me to do :) I cannot wait! I saw that post—you all have such nice handwriting!!! Thank you for doing this and for mentioning Toomer’s for Tuscaloosa. I live in AL and am minutes away from where some of the tornadoes hit. The church I work at has been working with TFT on donation drives and they truly are doing some amazing things to reach out to people who need help right now! I came across Amanda’s site last weekend…probably through Sweet Eats! I totally want to turn my handwriting into a font…love yours too Jessica! That is awesome!! I love your handwriting- I always wish I had cool print. I’m a cursive girl all the way, and my print is just weird looking! I am actually a fellow toomer in other words I go to Auburn University and have many friends from Tuscaloosa. Thank you so much for mentioning it in your blog. They have done so many amazing things and to see two huge rivals unite is fascinating! Keep baking I love reading! Not sure my handwriting would make a very pretty font – my husbands would be even worse. Such a lovely idea for a good cause. that is a wonderful idea! thanks for spreading the word. a good portion of my family is in alabama, and amazingly had very little damage. (devastation all around them, within blocks, but they emerged relatively unscathed). i live in nashville and escaped the floods last year unharmed and with no damage to hearth or home. volunteering has been my way of showing how thankful i am that i and mine have been so lucky, and to help those that didn’t manage to come out as well. it’s awesome that people so far removed from the devastation are trying to help too! thank you all!